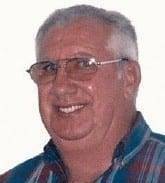 David (Dave) A. Baker Sr., 81, passed away peacefully on April 1, 2019 in Inverness, Florida of congestion heart failure. Dave was preceded in death by his parents George and Gwendyln Grime, his brothers Phil and Raymond Baker, his sister Gwen Takacs and his grandson Brett Baker. He is survived by his loving wife of 58 years Norma, daughter Christina (Tina) McQuillin (Rodney Imbrock) and sons Joseph (Cindy) Baker and David A. Baker Jr. (Sharie Hurst). Also surviving are his grandchildren, Danielle McQuillin, Jeffry McQuillin, Becka Baker, Amanda Baker and Mariah Baker, along with his sisters Shirley Bialecki, Janet (Bob) Savage and Donna (Dan) Gravance. Dave was a U.S. Navy veteran, a member of Fulton County React organization and a night security guard in Wauseon for many years. He retired from the Fulton County Highway Department after 27 years of service and then drove truck for Dave’s Sand & Stone for many more. He was a member of the Winameg Christian Church while living in Ohio and then attended the Redemption Christian Church for the last 15 years in Inverness, Florida. Dave loved to fish on Lake Erie, he enjoyed camping with his family, water skiing, and dancing on roller skates. He coached baseball and loved to watch his children play sports. Dave had an infectious smile, humorous wit and a kind, gentle personality that made it easy for him to be friends with everyone! Dave was a loving husband, father and grandfather, We believe he has now received his wings and is our guardian angel. Funeral services will be held on Saturday, April 13, 2019, at 11:00 AM, at the Edgar-Grisier Funeral Home, with Pastor Scott Rashley, officiating. Interment will follow in the Winameg Cemetery. The family will receive visitors, also at the funeral home, on Friday, April 12, 2019, from 2:00 PM until 7:00 PM. Memorial contributions in David’s memory may be directed to Redemption Church, P.O. Box 2241, Inverness, Florida 34451. Online condolences may be offered at www.GrisierFH.com. The Edgar-Grisier Funeral Home in Wauseon is honored with David’s care and arrangements. Be the first to comment on "David “Dave” Baker, Sr."